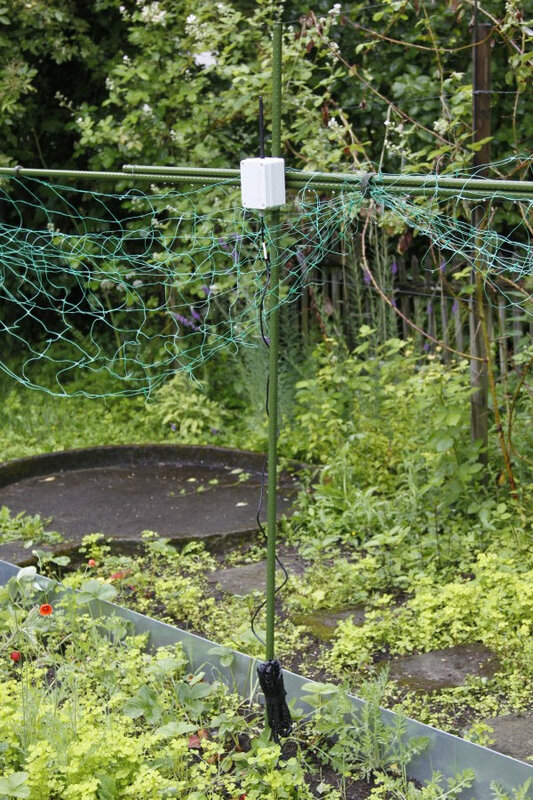 In the report “Digital in die Zukunft: Darmstadt ist deutschlandweiter Vorreiter” on RTL, city of Darmstadt showed our Ultrasonic Distance Sensor with LoRaWAN in the field. Our devices are used by the city for flood warning and help making maintenance more efficient in their water channels and sewer system. 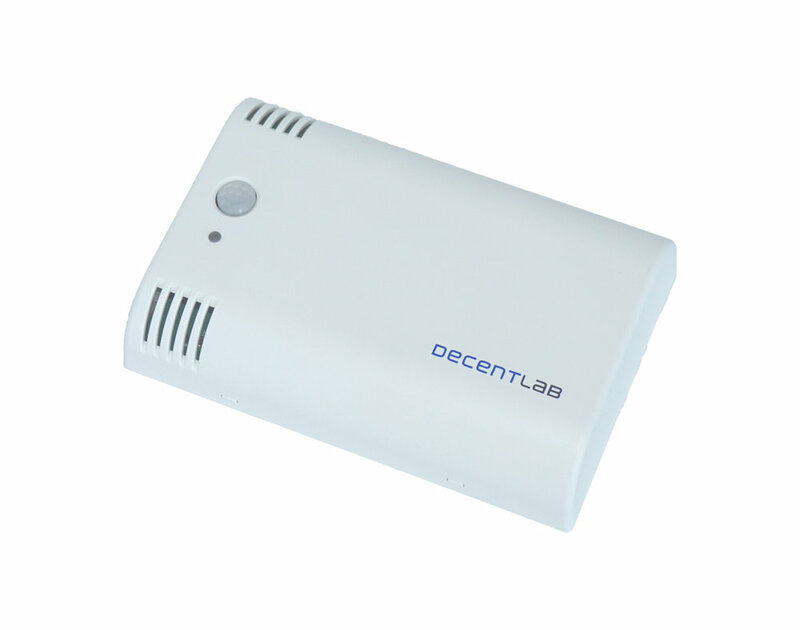 We have been awarded by @AIRLAB_Airparif @Airparif for our Indoor Ambiance Monitor capturing CO2, TVOC, Illuminance, Motion, Temperature, Humidity, and Barometric Pressure and sends data over LoRaWAN in the category "Sensibilation sur la qualité de l'air intérieur". Read more when final results and press release are published online! Last Friday, 08-Jun-2018, we recorded a heavy rain event in Dübendorf. In parallel, precipitation and the level of the River Chriesbach were recorded. In only half an hour an amount of 30 millimeter rainfall has been recorded. Nearby river levels raised by1 meter in only 1.5 hours and flooded the walkways! All measurements realized with our rain gauge and ultrasonic level meter sending data over LoRaWAN to our cloud infrastructure. Precipitation data provided by Eawag (absolute rain depths are still subject to verification). On 24th May Decentlab was featured in Einstein on SRF1. Two relevant projects in research, Carbosense/swiss.co2.live, initiated by Empa, Swisscom and Decentlab and the Urban Water Observatory of Eawag and ETHZ were presented. We are in both projects the main partner for the LoRaWAN based instruments and data services. The whole program Einstein of that day was dedicated to Internet of Things with a special focus on LoRaWAN. 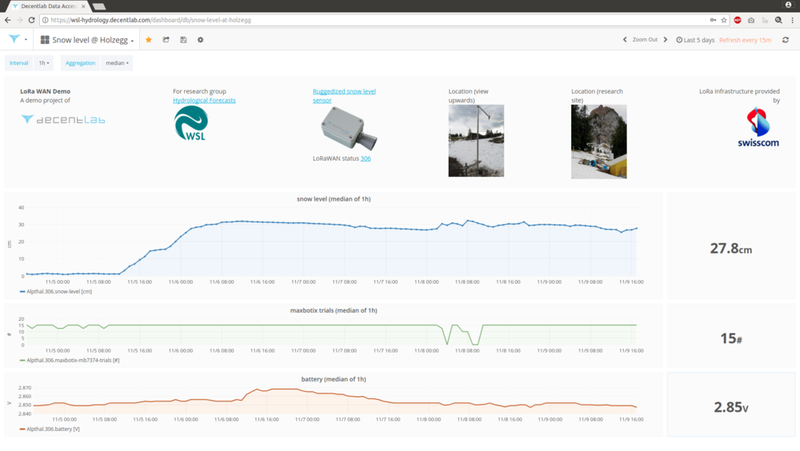 Kaltluftseen.ch, an initiative by Stephan Vogt, measured in the night of 13th February at Hintergräppelen -33.19 °C with our temperature and humdity sensor with LoRaWAN data transmission. We are looking forward to even lower temperatures! 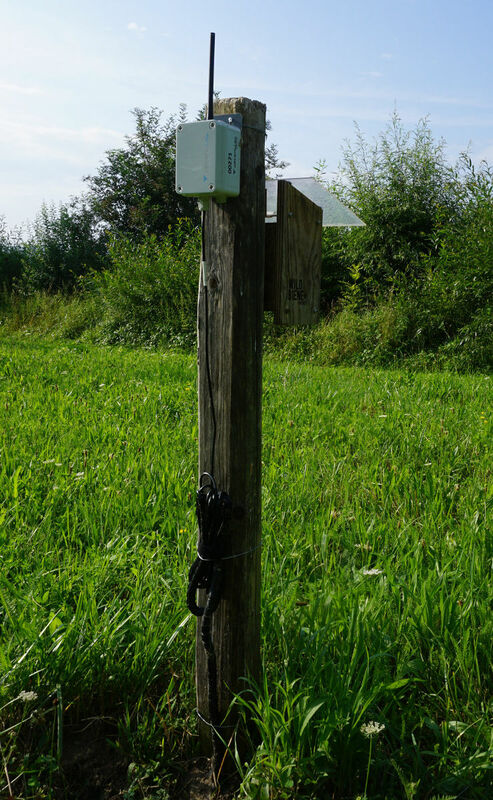 Kaltluftseen.ch, an initiative by Stephan Vogt, monitors frost hollows in Switzerland. 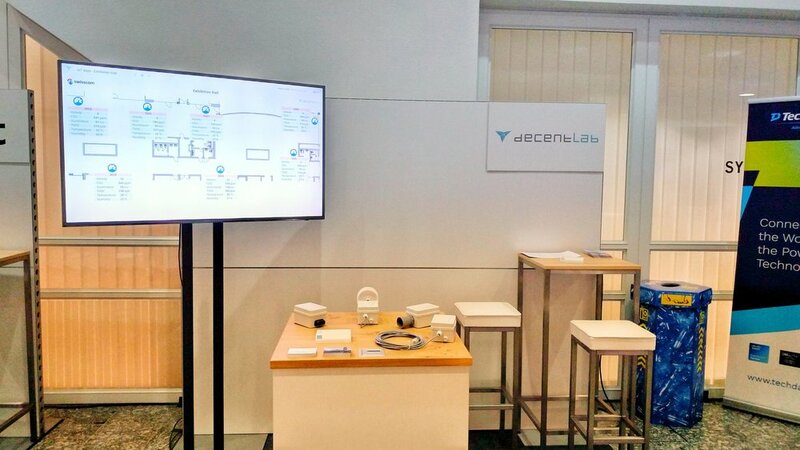 In this season he started to use Decentlab's air temperature and relative humidity with radiation shield (LoRaWAN) and the Data Access platform to monitor Hintergräppelen, a promising site to reach lowest temperatures in Switzerland. On Tuesday morning we recorded a new minimum of this season with -21.89 °C. We are looking forward for a really cold winter. 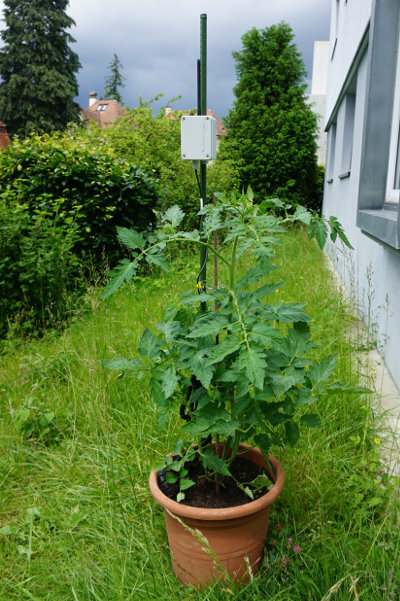 One full year of soil moisture, electrical conductivity and temperature data sent over public LoRaWAN network from 3 locations in Switzerland. We monitor for WSL, Hydrological Forecasts snow level for monitoring of a catchment with a variant of our Level/Displacement Sensor using an ultrasonic sensor. Beginning of this week we caught first snow fall measurements and now we can observe how it melts down or more layers of snow will add up on the cover over the next weeks and months. The distribution of the CO2 concentration in the City of Zurich averaged over 2013 and 2014. Thanks to the readings from the sensor network, this kind of model calculation will be more precise in future. 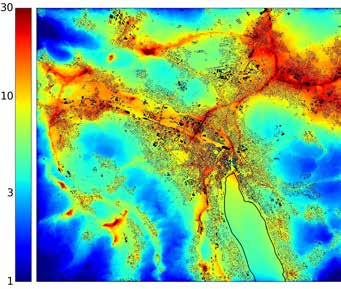 Switzerland is to gain a dense, globally unique CO2 measuring network: 300 sensors permanently collect up-to-date readings, which form the basis for atmospheric dispersion models that are being developed at Empa. Visit us on 14th June at LoRa Alliance All Members Meeting in 3rd Floor Franklin Institute, Philadelphia. See you there. Empa, Laboratory for Air Pollution / Environmental Technology is calibrating and testing our LoRaWAN CO2 sensors in the pressure chamber at Metas. See our LoRaWAN sensor devices at the booths of Orbiwise, Actility and LoRa Alliance during Mobile World Congress 2017 in Barcelona. Thanks to all the partners which exhibit them. Check out our new demo together with OrbiWise. OrbiWise provides a full network software solution for LoRaWAN-based networks. Our sensors and application server fits perfectly in combination with the network server from our partner. The demo shows a piezoresistive pressure and temperature sensor for level metering applications like water supply, waste water, ground water or surface water.